Located close to the centre of Stafford with access to all major transport links, our Clubhouse with its large function room sits in 11 acres with views across open fields and is the perfect venue for any event. 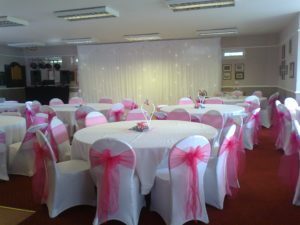 The large function room can be hired for up to 100 people seated and 120 standing, has a licensed bar, dance floor and is ideal for birthday parties, christening celebrations, wedding receptions, corporate events and funeral wakes. 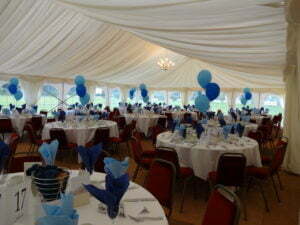 Should you be planning a larger function, we are also able to offer a marquee situated in the grounds of the Club. The Function Room – seating a maximum of 100 people theatre style, or 70 people cabaret style. The Members’ Lounge – seating a maximum of 25 people. This can either be hired on its own, or in addition to the main room as a breakout/refreshments room. For an added special touch, we can dress the large function room with white table linen and white chair covers. We can provide a DJ for £135, or you are welcome to make your own arrangements. There will also be an additional cost of £200 to provide doormen for 18th and 21st birthday parties. For more information, to check availability or to make a booking, you can contact us on 07716 853940 or get in touch via the button below. We look forward to welcoming you to Stafford Cricket & Hockey Club.